Column of Marcus Aurelius: We all know a lot about Trajan's Column at the northern end of Rome's imperial forums, but we probably know less of the equally grand column of Marcus Aurelius, in Piazza Colonna at the intersection of Via del Tritone and Via del Corso. (If you don't know Trajan's Column, go to http://www.mmdtkw.org/VTrajanColumn.html.) Marcus Aurelius, as we all know from the "Gladiator" movie, spent a lot of time fighting in northern Europe -- north of he Alps, that is. Nobody knows precisely why the tribes in what are now the Czech and Slovak republics became so violently and continuously restive at this moment in history, but the Roman Empire had to act to keep control of the area. Marcus Aurelius, who would rather be studying Stoic philosophy, stoically shouldered the burdens and spent the bulk of his time trying to keep order in the north. Among the groups he fought, until the time of his death as it turned out, were the Marcomanni, a local group, and the Sarmatians, who had migrated to the area from Iran and were famous for their women warriors. There were other troublesome peoples in the area, but these two groups came to symbolize Marcus Aurelius's northern campaigns, because it was the wars against them (172-175 AD) that were eventually memorialized on Marcus Aurelius's column. When Marcus Aurelius died of "plague" (which was then a generic term), Commodus quickly wound down the wars and declared that his father had won them. Commodus was granted a triumph, but he dedicated it to his father. (For more on Commodus, go to http://www.mmdtkw.org/VCommodus.html.) Sometime thereabout, the Senate also authorized a victory column, and what was built was obviously a copy of Trajan's Column a few hundred meters south and on the other side of Via Lata (now Via del Corso). The exact year that the column of Marcus Aurelius was raised is unclear, but an inscription found nearby, indicates that a procurator appointed for the column's construction had a shelter near the site in 193 AD. 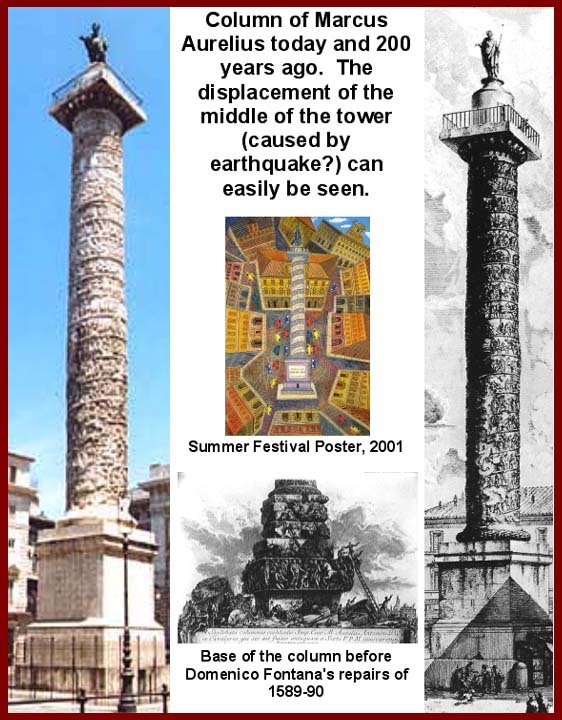 The column was probably intended to be part of a larger complex including a temple to the deified Marcus Aurelius, porticos, etc., but there are no remains to indicate if anything else was actually built. The column had a much better fate than most of the other Roman monuments in the Campo Marzio, because in the tenth century, well before the beginning of Renaissance plundering, it became the property of the powerful Benedictine order: neither clerical nor aristocratic thieves dared lay hands on the large pieces of Luni marble (the most expensive of the Carrara marbles). At some unremarked date, the upper part of the column was displaced a bit by an earthquake, and the twisting movement is just visible in the figure of Victory inscribing a shield that marks the end of the first part of the pictorial history (Marcomanni) and the beginning of the second (Sarmatian). The Marcus Aurelius column is similar in plan, if not in detail, to Trajan's Column, which had been built 80 years earlier. The base was higher, as noted above, and the column tapers less toward the top. There are 26 circular drums in the column itself, and the 21 turns of the reliefs are carved deeper and with more undercutting. Background details are more schematic and therefore less revelatory. Like Trajan's column, this one was brightly painted and figures of the Emperor would have been gilded, but that was all lost over the years. Carved into the interior is an internal spiral staircase of 200 steps around an internal pillar, which is lit by 56 small rectangular windows. The shaft, with its base and capital, is almost 30 meters high. There is a square platform above the capital surmounted by a circular base supporting the statue of St. Paul. Coins from the reign of Commodus show four free-standing statues of Roman eagles standing on the top corners of the base. The column, like many other Roman monuments, was cleaned up for the 2000 Jubilee, and more importantly, the Piazza Colonna, surrounding it has been made into a pedestrian zone. Vehicular traffic on Via del Corso from Via del Tritone to Piazza Venezia has also been limited, but during rush hours it still seems to be jammed from one end to the other. Hopefully plans to further restrict traffic will be carried out and vehicle-exhaust damage to the column and the monuments will be limited. Images of the column are at http://www.mmdtkw.org/AU0746aColumnMAurelius.jpg, http://www.mmdtkw.org/AU0746bMAureliusColumn-2.jpg, and http://www.mmdtkw.org/AU0746cMAureliusColumn.jpg.